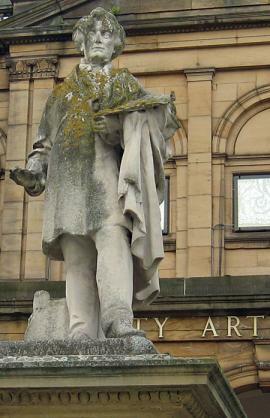 This is a statue of William Etty, in Exhibition Square, in front of the Art Gallery. He was carefully cleaned in 2004, but now the lichen is growing vigorously all over him, apparently more vigorously than it did before he was cleaned. Perhaps someone who understands lichen and its ways can explain this. Lichen can look attractive growing on old tombstones and dry-stone walls, but on Etty it makes him look rather sad and neglected, again. Less than eight years since he was last cleaned. I believe York Civic Trust paid for the previous cleaning, so it didn’t come out of council tax, but still, maintenance of statues appears quite costly. He’s been here since 1911, thoughtfully placed in front of York Art Gallery – him being an artist – looking across to Bootham Bar and the city walls, the demolition of which he protested against. Anyone who helped stop the destruction of Bootham Bar is clearly deserving of recognition. But reproducing a particular individual’s likeness in stone and putting them on a plinth now seems rather old-fashioned. 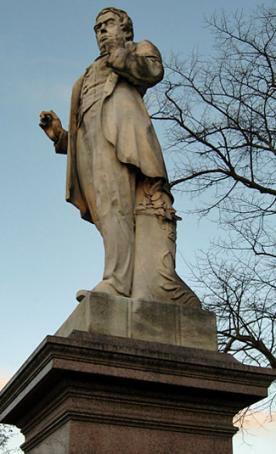 When the composer John Barry died recently, there were calls for a statue here in his hometown. There are, occasionally, calls for statues. Less often, thankfully, than in the 19th and early 20th century, which is, perhaps, where statues belong. Not long ago, The Range, a large store at Huntington, draped an advertising banner around his plinth. They got into some trouble for this, though they perhaps should have our appreciation for helping to draw attention to a statue most people had forgotten about. And of course there’s Queen Victoria. 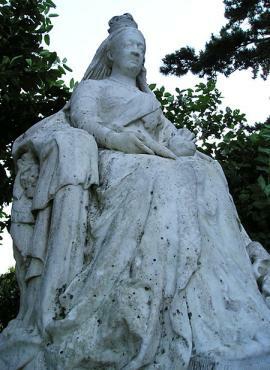 Deeply respected, but her statue was shunted off from its original location and dumped in West Bank Park, where she has fascinated and frightened passing children ever since. She’s a bit forbidding and spooky. When I was a child, it didn’t mean much that it was Queen Victoria, and certainly didn’t teach me anything about her life. More recently, we have the very photogenic statue of Emperor Constantine by the south door of the Minster. I don’t have a photo of this, mainly because everyone else does, so there seems little point. It’s a handsome piece of work indeed. But aimed at impressing visitors, I think. It doesn’t make me feel connected to our Roman heritage. It’s a man on a plinth, this time a man looking in a contemplative way at his sword. Constantine is looking clean, but Mr Etty will no doubt have to undergo cleaning again, which is, I imagine, a rather painstaking process – they can’t just go at him with a wire brush. I don’t think we have any others in an outdoor location? Which is perhaps just as well. Since this page was written there has been a consultation exercise on ideas for ‘reinvigorating’ Exhibition Square, one of which was that the Etty statue could be moved out of its central position. There are several more recent pages on the square, the statue, and the adjacent fountain. See all pages tagged ‘Exhibition Square’. I think Etty should stay where he is.